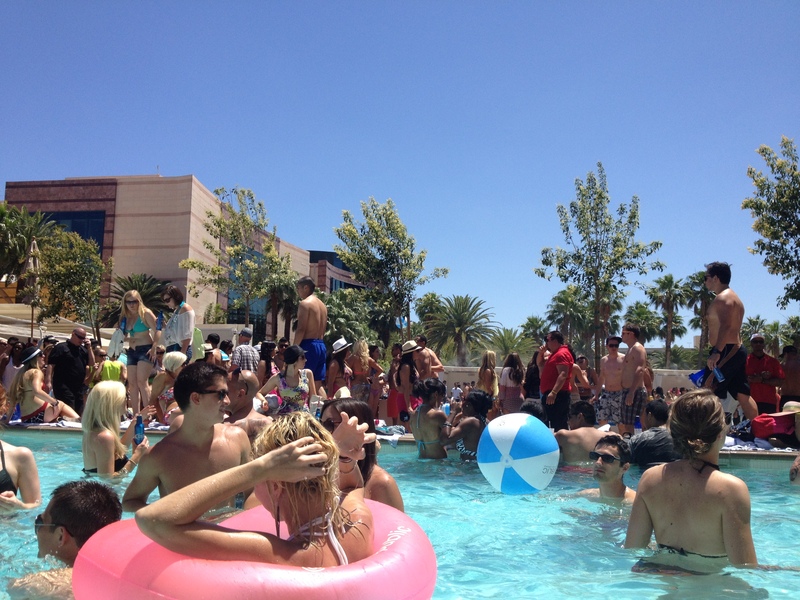 Wet Republic Pool Party | how 'bout some cake? 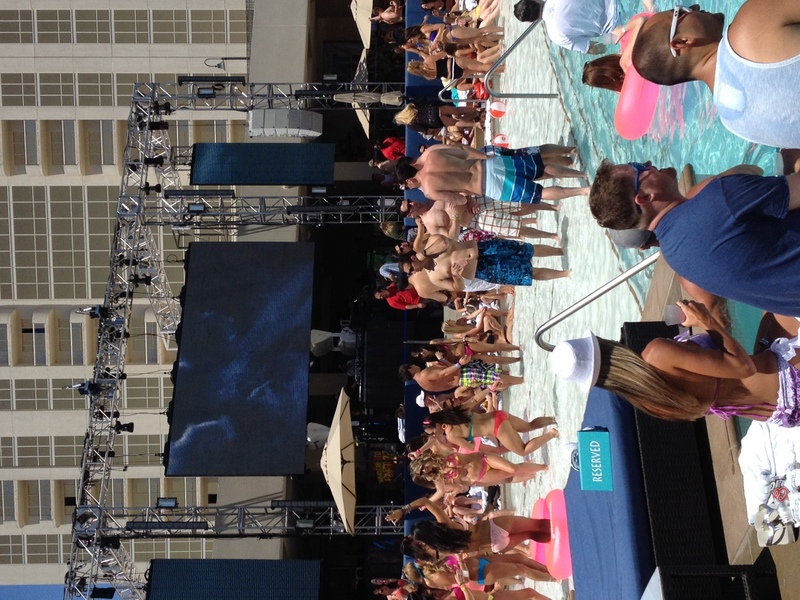 Las Vegas is a bit legendary for their pool parties, and not without reason. 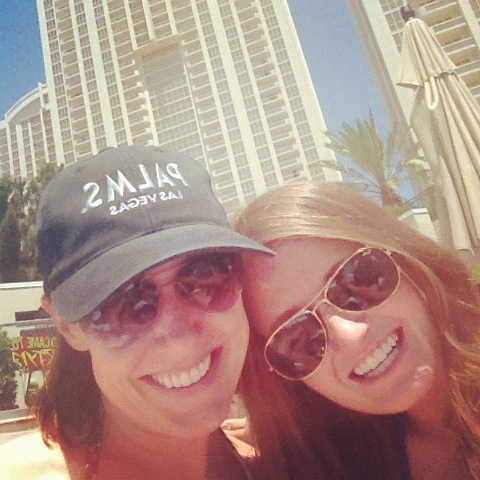 My friend Dawn landed us on the VIP list for Wet Republic this weekend, and thank God she did! Our contact warned us to be there early, so we made sure to get there before noon. When we arrived, all we could see was a line. We were told that this was the line for people on the guest list, so we begrudgingly took our place in it. Since Dawn made the arrangements, she disappeared up to the front of the line to check things out while the rest of us held our spot. Less than a minute later she reappeared and waved us forward. It wasn’t until this point that I really realized how long the line was. We took turn after turn and the line just continued. Eventually we got to the gate, where they let us in almost instantly. After a thorough pat down and bag search (anything consumable or glass is confiscated, including gum) we were finally permitted entrance to the pool party. When we got there, it wasn’t crowded at all. 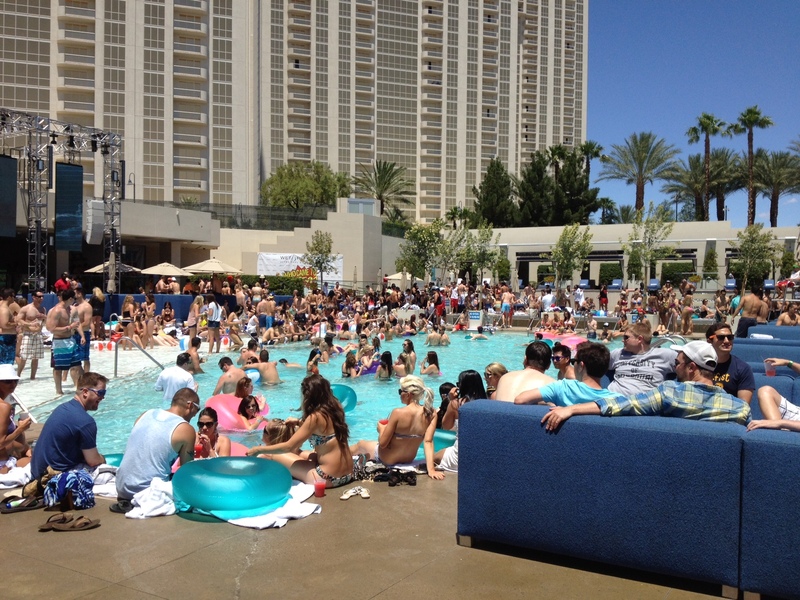 We ordered some drinks and found a spot on the edge of the pool to hang out. Within an hour, the place was packed. Everybody was drinking, dancing, hitting beach balls… it was really fun! People were friendly and surprisingly well-behaved (granted, it was early, but it’s also Vegas). Pro tip: order a bucket of beers. They’ll put ice in there, and you can take it to the pool area with you so you don’t have to wait in line for every drink. We drank and danced and had a wonderful time. I’ll be back again- as long as I can hop the line again! And maybe next time we’ll spring for one of the cabanas for a shady option. The Vegas sun is no joke! 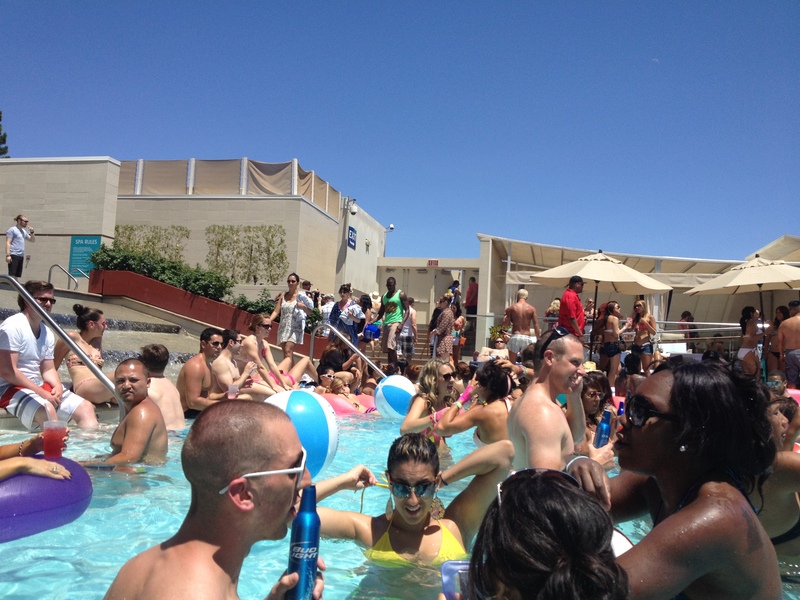 If you’re ever in Vegas in the summertime, make sure to hit up one of these parties! Don’t forget your sunscreen, and don’t even bother trying to sneak food or booze in. They won’t make it past the gate. And try getting in touch with a promotor beforehand to minimize the cost and hassle! 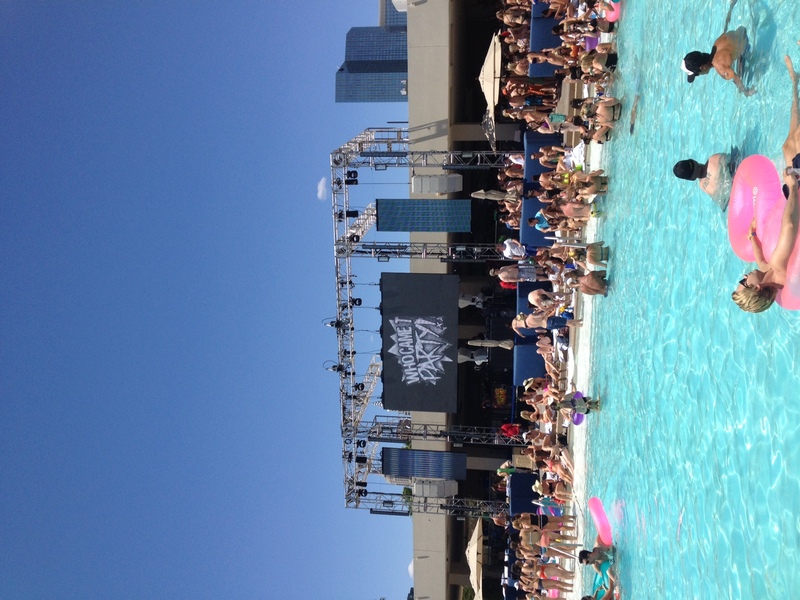 This entry was posted in Travel and tagged fun in the sun, Las Vegas, las vegas pool party, party, pool party, Travel, wet republic. Bookmark the permalink. Glad you had a good time. 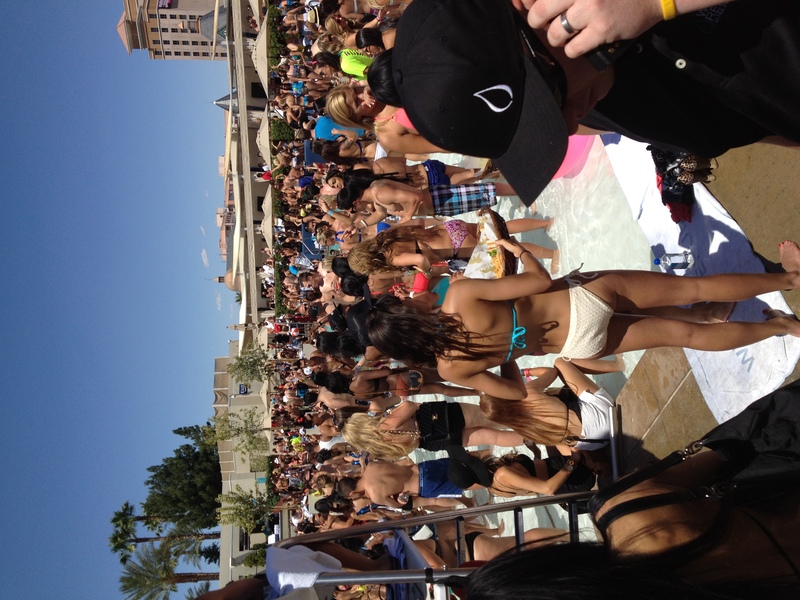 Last time I was in Vegas I went to Tao Beach and had a great time, but that was about three years ago so I’m overdue for another trip! You should also try the Tao Nightclub! I’m sure you’ll have a great time!